I am moving toward economy in all aspects of my life. Economy of resources, of words, of effort. Minimal expenditure, maximum gain. That old saying that sometimes less is more? Yep – that’s what I’m going for. 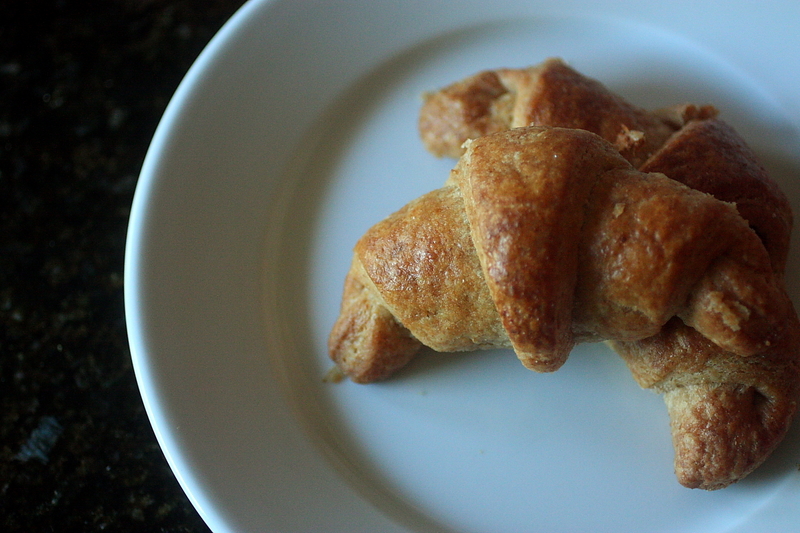 This puff pastry embodies the concept. Few ingredients, simple technique, maximum impact. Elegant, flaky, delicate. Impossibly thin layers – thousands of them – shatter and melt in your mouth. When I saw a similar product at the market for $12, I thought to myself “how the hell can this lump of flour and butter cost $12?” Surely I could create something just as good for pennies on the dollar, and I could do it using whole grains rather than refined white flour. The recipe is adapted from the good old Joy of Cooking. I used freshly ground soft winter wheat, ground it fine, and then passed it through a medium-mesh sieve to remove the largest bits of bran and germ. Add ice water and pulse just until dough comes together in a ball. Form a 5-inch square, wrap in plastic and refrigerate for 1 hour. Process mixture until it looks like fine gravel. Scrape down sides of bowl and process until smooth. Scrape onto a sheet of plastic wrap, form a 6-inch square, wrap and refrigerate while you roll out the dough. From here, it’s all about technique. Handling the dough as little as possible, yet creating layer upon layer of buttery, tender pastry. 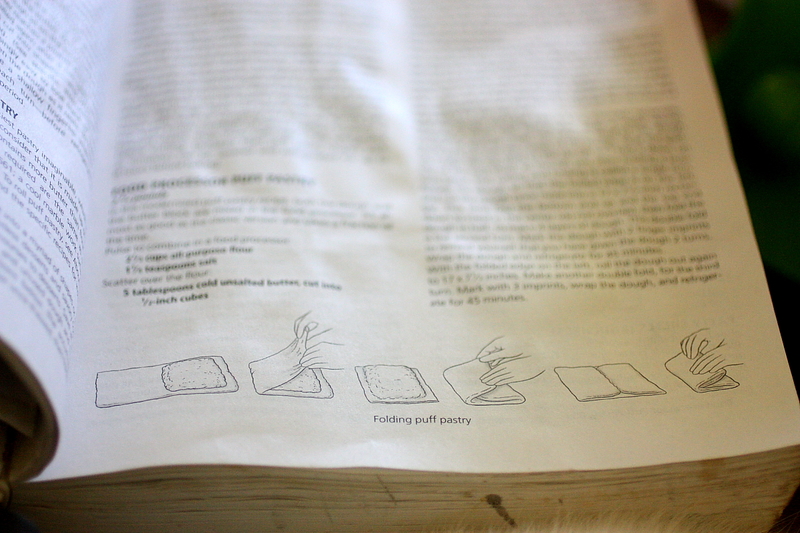 First, you roll the 5-inch square of dough out to a 13×8 inch rectangle. You place the 6-inch butter block at one end, and fold the other end of the dough over it, crimping the edges to seal all around it. Roll this out to a 17×7 1/2-inch rectangle. Fold the bottom third up over the center of the dough, and fold the top third down over the bottom third, like folding a business letter. Turn this so that a short side is facing you, and roll it out once more to a 17×7 1/2-inch rectangle. Fold the top 1/4 down and the bottom 1/4 up to meet in the center. Then fold this in half, creating four layers of dough (this is a “double fold” – you will be repeating this step two more times). Refrigerate for 45 minutes. Roll dough to 17×7 1/2-inch rectangle again, do a second double fold, and refrigerate for another 45 minutes. Do the same again, and refrigerate for another 45 minutes before using (or freeze if not using immediately). 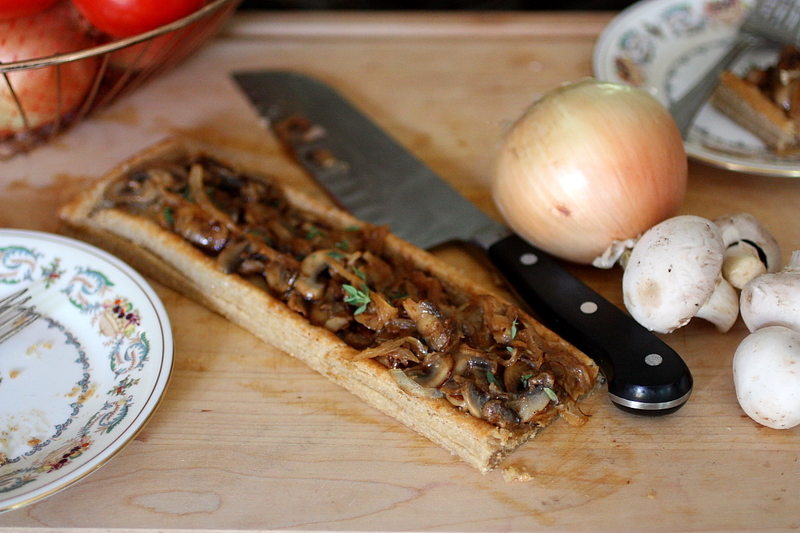 To test the success of this simple pastry, I decided to pre-bake a tart shell. I rolled about a third of the dough out to a 1/4-inch thickness, creating a long thin rectangle. I created a border by trimming about 1/2 inch of dough from each of the four sides and adhering them to the edges with an egg wash. I brushed the entire thing with egg was and sprinkled it with sea salt. I docked the center with a fork, to keep it from puffing to much, and I baked it at 375F for 10 minutes. I made a filling by sauteing 8 oz. 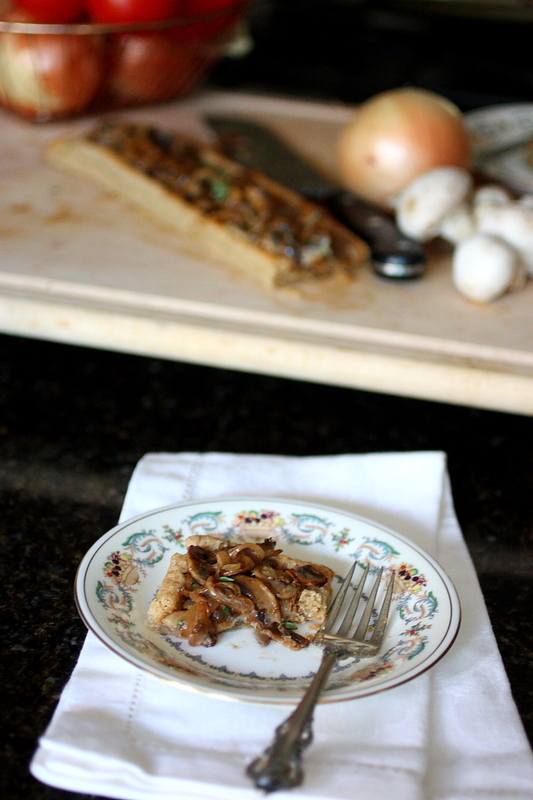 of button mushrooms and 1/2 a thinly sliced yellow onion in 2 tablespoons of butter until golden brown and soft. I seasoned with a pinch of salt and pepper, and finished it off the heat with an ounce of good goat cheese and a tablespoon of heavy cream. 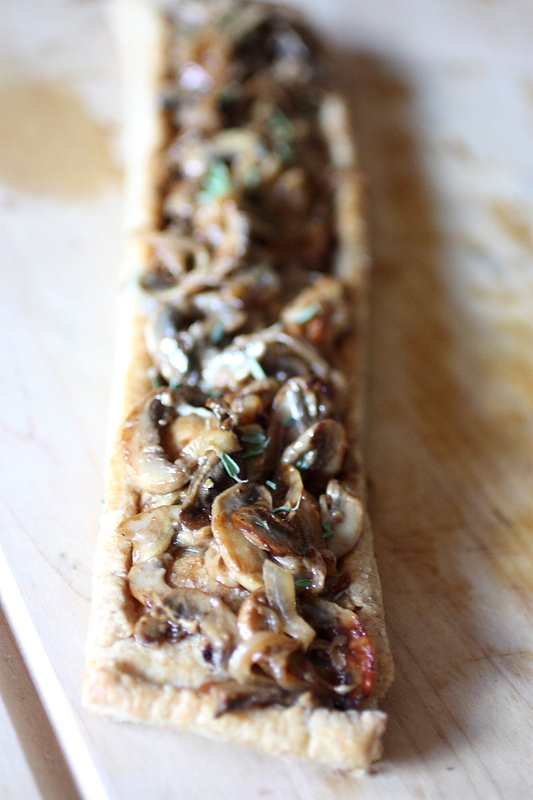 I spooned the filling into the shell and sprinkled a few sprigs of fresh thyme over the top. The final product was something I’d be proud to serve as a first course at the finest of dinner parties. Sliced into two-inch square servings and placed atop my grandmother’s fine china, it was the epitome of refinement. 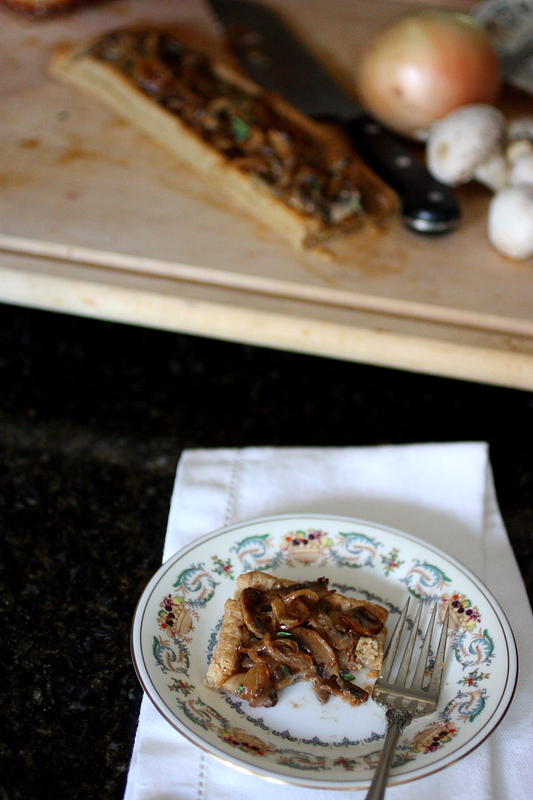 The earthy, musky mushrooms paired with the sharp chevre and the sweet, buttery onions, spooned in thrifty measure onto the golden brown pastry – it was a memorable marriage of flavor and texture. There is a lesson to be learned here. It doesn’t require a lot of money, or a laundry list of ingredients, to create elegant food. Simple, real ingredients, treated with care and minimally processed, can result in the most elevated of pastries. A case where less truly is more. Flour, butter, water, salt. 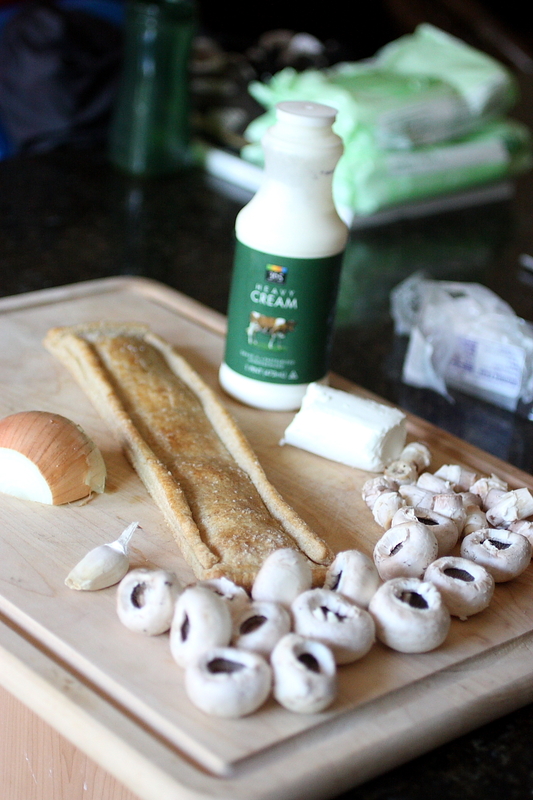 Four ingredients, that’s all. It’s what you do with those ingredients that makes all the difference. I went shopping last week at one of my favorite places in Atlanta, Your Dekalb Farmers Market. I needed some coconut oil, and I knew they were supposed to carry expeller-pressed coconut oil at a very reasonable price. Unfortunately, it is not near my house. At all. So it’s not like I can just run down there whenever I need something. It’s kind of a special treat. And when I go, I have to explore every aisle, and peruse all of the exotic produce. I check out the cheese selection, and see if there is any fabulous seafood I can’t live without. It’s quite the expedition. And I always end up putting things in my shopping cart that I didn’t plan on when I started. In fact, on this particular visit I had only one thing in mind when I went – coconut oil. Guess what they didn’t have? Right – coconut oil. Sold out, I was told by the friendly Ethiopian man who was stocking shelves on that aisle.